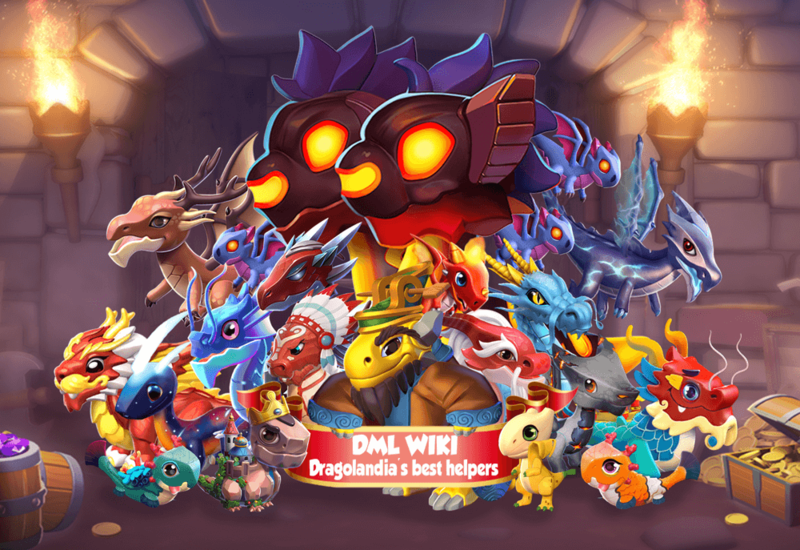 Dragons represent the primary feature of Dragon Mania Legends and are the very foundation of the game. These inhabit the world of Dragolandia, along with many other human characters, and can be found working alongside or against the Trainer. There are hundreds of species of Dragons in the game, each species having a unique appearance. Almost all Dragons are able to breed with one another to produce more Dragons, battle against other Dragons, or even produce Gold. Dragons hatch from eggs and then transition from their baby stage to their adult stage upon being fed. Feeding is the only way to strengthen and grow a Dragon. Dragons do not age past their adult form, only increase up to a maximum level through feeding, meaning they may be immortal. At Level 4, the young Dragon assumes its adult form and can then breed, train, improve its skills at the Dragon Academy and participate in various battles in the game. The only way for Trainers to get rid of their own Dragons is to sell or ascend them. Chronos and Clan Dragons are the only unsellable Dragons in the game. There are several ways to obtain Dragons. Theoretically, any Dragon can be made available as part of a limited or permanent bundle in the Main Shop, turning this method into the fastest one in the game. Aside from possible bundles or deals, the most common way to obtain Dragons is through breeding for them in the Breeding Den, the only place where Dragons can mate with one another. They can also be bought from the various shops in the game, such as the Main Shop or Dungeon Shop, using a specific currency. There are several Base Dragons in the game, each embodying a different Element, which can be purchased with Gold from the Main Shop when the Trainer reaches a certain level. These are the only ones that can be purchased in exchange for this currency. Some Dragons in the game can only be bred or bought during a limited-time period. However, there are many other Dragons that are unbreedable. Clan Dragons and Boss Dragons are such Dragons, with the former being attainable only through Clan-related activities and the latter through purchasing in exchange for Gems after several conditions have been met. There are also Dragons that are won through competing in the various events that take place in the game, either against other Trainers or against the game itself, or as part of a Clan completing various quests or competing against other Clans. Other Dragons are earned through different battle settings, such as those in the Clockwork Dungeon, Enchantment League, Dragon League and Campaign Map. Once a Dragon egg is obtained, regardless of the method, it must then be incubated in the Hatchery until it is ready to hatch. The only Dragon that does not come from an egg is Chronos, a Dragon that possesses no Elements or rarity and is obtained through a unique method. Eggs that that do not come from breeding will be found in the inventory under the tab and can be sent to be incubated from there. After hatching the Dragon, it will need to be placed in a fitting Habitat or in the Dragon Vault. The Codex keeps track of all the Dragons in the Trainer's possession, as well as in the entirety of Dragolandia, except Clan Dragons and Chronos. Dragons obtained through Enchanted Breeding are unbuyable, even if they are present on the Trainer's islands. With very few exceptions, Divine Dragons are also unbuyable. Lastly, Chronos is unbuyable, as well, and can only be obtained once by finding various shards of Chronosian Seals while exploring ruins. A Trainer is considered to have duplicates of a Dragon if two or more of the same species are present, at the same time, in a Habitat on any of the Trainer's islands or in the Dragon Vault. In extremely rare cases, usually during large-scale events, duplicate Dragons in the inventory can be taken into consideration as such. Most Dragons that are acquired through a method other than buying or breeding are not usually available to be bought as duplicates until they are obtained and hatched by the Trainer and then subsequently placed in a Habitat or in the Dragon Vault. Normally-Breedable Dragons and Dungeon Dragons, VIP Dragons (as long as the Trainer has the necessary VIP Level), Boss Dragons (as long as they are beaten at least once in Normal Mode), Dragons that are currently limited-time breedable (except Chain Breeding Events), and Dragons that are currently part of a promotion or bundle in the Main Shop can always be purchased without prior presence on the islands. However, the first three category of Dragons and Dragons made available through Breeding Tokens must first be unlocked as the Trainer progresses through the game. Dragons that can be purchased as duplicates will usually be buyable in exchange for Gems. Base Dragons are always purchasable in exchange for Gold while Dungeon Dragons are always purchasable in exchange for Dungeon Tokens. There is no limit to how many Dragons of the same species a Trainer can obtain through breeding, as long as that particular Dragon is currently breedable. Additionally, Card Dragons (a type of Dragons that are obtained only in exchange for matching Dragon Pieces) can be obtained as duplicates since there is no limit to how many matching Pieces a Trainer can have for any of those Dragons. With the exception of Chronos and Clan Dragons, Trainers can have duplicates of the same species of Dragons. The Trainer can also not come into the possession of more than one of the same species of a Boss Dragon, unless that Dragon is made available for purchasing in a bundle, promotion or sale. Since some Dragons need to be present on the islands in order to purchase duplicates thereof, those obtained through a method other than buying or breeding will most likely never be obtainable again if they are sold. All Dragons in the game, in addition to their species name or simply their name, have given names. Only Chronos, Clan Dragons, and Boss Dragons have no given names. These given names are randomly assigned to Dragons upon being hatched, but the Trainer can choose to rename their Dragon through that specific Dragon's Codex Entry and give them another name that is limited to six characters. Update 4.4 made the Fairy Dragon obtainable only through matching Dragon Pieces. Prior to this update, its cost to purchase it as a duplicate was 4,090 Gems. Update 4.3 turned the Professor Dragon into a Normally-Breedable Dragon because of the discontinuation of the Mentoring Program. Update 4.2 turned the Agnes Dragon, the Elephant Dragon, the Imperial Dragon and the Masque Dragon into Normally-Breedable Dragons. Update 4.0 introduced Breeding Tokens, a new method of breeding specific Dragons. All Dragons, except Clan Dragons and Chronos, now benefit from a value called the Dragon Collector Points, whose only purpose is to rank Trainers on the Dragon Collector Leaderboard. The Rhino Dragon and the Orca Dragon were turned into Enchantment-Breedable Dragons. The rarity of the Rhino Dragon, the Orca Dragon and the Pinata Dragon was changed from Epic to Legendary while the rarity of the Herald Dragon was changed from Rare to Epic. Their Elements were also changed: those of the Rhino Dragon were changed from to , those of the Orca Dragon were changed from to , those of the Pinata Dragon were changed from to and the Herald Dragon received the Metal Element in addition to its other two Elements. The Gladiator Dragon, the Machine Snake Dragon, the Golem Dragon and the Garden Dragon were made obtainable through matching Dragon Pieces. Prior to this update, once obtaining and hatching the initial egg, duplicates of them could be purchased at a cost of 1,000 Gems, 1,640 Gems, 1,650 Gems and 3,990 Gems, respectively. Update 3.8 made the Ace Dragon obtainable only through matching Dragon Pieces. Prior to this update, its cost to purchase it as a duplicate was 1,625 Gems. Update 3.7 changed the parents of the Leopard Dragon from the Brick Dragon and the Tribal Dragon to the Wind Dragon and the Fire Dragon while the parents of the Sea Turtle Dragon were changed from the Melon Dragon and the Tree Dragon to the Plant Dragon and the Wind Dragon. Update 3.3 turned the Gorilla Dragon, the Leopard Dragon and the Sea Turtle Dragon into Enchantment-Breedable Dragons. Update 3.2 added additional VIP Levels and changed the levels at which the VIP Dragons are obtained. Prior to this update, the Mystic Dragon was obtained at Level 2, the Elixir Dragon at Level 4, the Midnight Dragon at Level 6, the Calavera Dragon at Level 8, the Quadwing Dragon at Level 10, and the Tiki Dragon at Level 12. Update 3.0 made the Heavy Metal Dragon obtainable only through matching Dragon Pieces. Prior to this update, once obtaining and hatching the initial egg, the cost to purchase it as a duplicate was 1,250 Gems. Update 2.9 discontinued the Razor Dragon and the Blueflame Dragon as prizes for completing collections in the Dragon Codex and made the Steampunk Dragon and the Bighorn Dragon purchasable as duplicates. Starting with this update, the Cookie Dragon, the Kangaroo Dragon and the Piggy Bank Dragon are no longer obtainable through Daily Quests and are now found in regular card packs. Prior to this update, the cost to purchase them as duplicates was 840 Gems, 1,600 Gems and 1,500 Gems, respectively. Update 2.0 introduced Card Dragons and made the Liquid Fire Dragon and the Mummy Dragon to be obtainable only through matching Dragon Pieces. Prior to this update, the Liquid Fire Dragon could be obtained through events and the cost to purchase it as a duplicate was 950 Gems, whereas the Mummy Dragon was available for purchasing through real currency on one occasion and the cost to purchase it as a duplicate was 1,050 Gems. Additionally, the Tick Tock Dragon can now also be obtained through matching Dragon Pieces in addition to connecting the game to an Apple Watch. With the introduction of the Dragonscale League in this update, the Mech Dragon, the Tsunami Dragon and the Warlord Dragon are no longer obtained from the top spots of the Diamond League but from those of the new league. Update 1.5 introduced the Light and Shadow Elements, as well as unlockable Elements for Legendary Dragons. It also made the Steampunk Dragon (and other subsequent Dragons obtained through Heroic Mode) and Tick Tock Dragon unpurchasable. Prior to this update, the cost to buy duplicates of the Steampunk Dragon was 3,000 Gems while duplicates for the Tick Tock Dragon cost 900 Gems. Update 1.3 introduced the methods of obtaining Dragons through the Friend System and the Clockwork Dungeon and made the Hammerhead Dragon obtainable as part of a promotional reward in the Dragon League rather than events. The breeding time for the first Tribal Dragon obtained through this method was changed from 5 minutes to 12 hours, as are all subsequent Tribal Dragons. There was no change to the hatching time, which remains at 5 minutes. The following 200 pages are in this category, out of 585 total. This page was last edited on 5 April 2019, at 10:06.